Despite the rise of social networking, instant messaging tools still count for much of the time we spend online. We like talking to people, and social network status updates give us cues and context for our conversations. So why not bring the two together? That's the rationale behind the new version of Live Messenger. The Wave 4 version of Messenger is a very different piece of software from earlier versions. Not only does it take up a lot more screen real estate, its new larger view is designed to draw in much more social-network information from sites like Facebook and MySpace. It's an interesting alternative to the status streams of the social websites, or tools like Seesmic and Tweetdeck, featuring a well-designed layout that shows selected comments as well as status messages. Messenger lets you choose social network favourites, giving you the option of seeing updates just from family and friends rather than the person you met at a trade show and thought might be a useful contact. If it all gets too much then there's an option to quickly switch to a compact view, with the familiar list of contacts. There are plenty of little tweaks in Live Messenger, including tabbed conversations and tools for quickly adding photos. Video chat gets an update too, with offline video messaging and support for HD cameras. 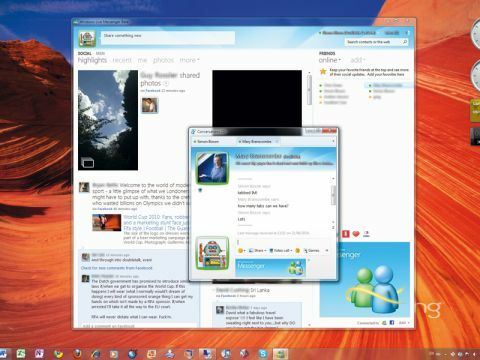 There's also improved integration with other Windows applications, with Live Messenger lighting up as an additional social network inside Outlook 2010 – so you can see if contacts are online before sending emails, or alternatively drop them an IM. We weren't sure about the new Messenger at first, but it's grown on us. It does take up a lot more screen, but it also gives us a quick overview of just what's going on with friends. Our only real quibble is that the advertising blocks are perhaps a little too large, but after a while they're easy to ignore.